A couple of months ago, Thora had an eczema flare-up that I felt like I couldn’t get rid of. Most of her flare-ups make her legs patchy and red for a few weeks and then it goes away. This one wasn’t going away, so we took her to her doctor and got some recommendations, but I also brought up possibly doing allergy testing. She had a bad reaction to a kiwi last fall (vomiting, red mouth/chin, a hive next to her mouth) that we treated at home with Benadryl, but it did freak me out because she’d had kiwis before with no visible ill effects. Given the kiwi incident and the current eczema problem, I asked if it would make sense to do the allergy test. Her doctor agreed, and we made an appointment for a blood draw. Thora handled the blood draw like a champ – I don’t even think she blinked when the needle went in. A few days later, I went to meet with her doctor to get the results. Additionally, her IgE number, which according to the paper should be between 0 and 60? It was 1131. 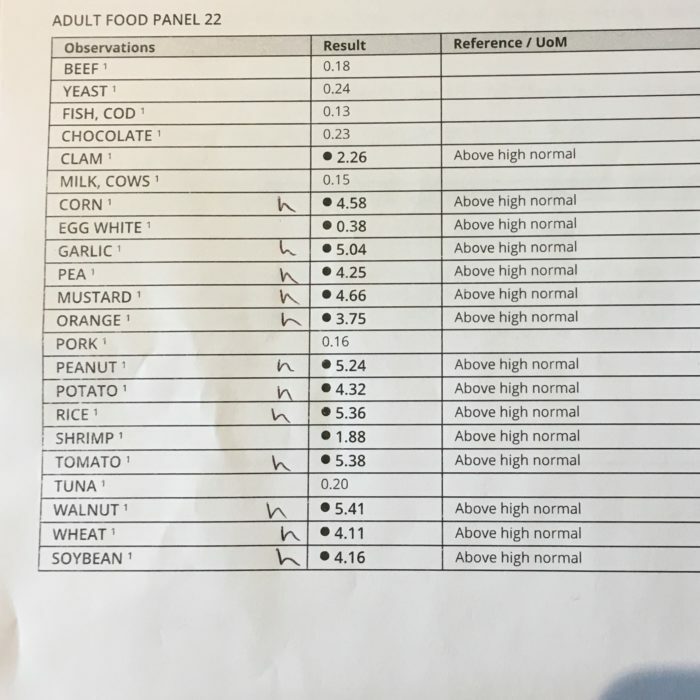 Her doctor (Dr. M) was incredibly sympathetic and advised us to eliminate the foods she showed responses to from her diet and to feed her the “safe” items on the list. That said, she acknowledged it was incredibly restrictive and difficult and said that while she could counsel us on what to feed Thora, she would have to Google it first. I asked for referrals for people who would know, and we agreed on sending us to a local allergy clinic and a nutritionist. Dr. M let me know that the lab still had a bit of Thora’s blood left on which we could run additional tests. We agreed to test for coconuts and almonds because if she can’t have wheat, potato, or rice, those are the alternative flours she could potentially have. Plus, she drinks almond milk nearly every day since we already avoid dairy for her. Dr. M’s office called me back later that day to tell me she tested positive to coconuts and almonds as well. By that point I had used up all my devastation and panic and I limply agreed to avoid those as well and hung up. It took two weeks to get in to the allergy clinic, during which we fed Thora an incredibly limited diet of meats, vegetables, and fruits, and cooked everything from scratch. We had a really hard time finding any prepared foods that would be safe for her given the sheer number of foods to avoid. I wasn’t sure what the visit to the allergy clinic would entail, and the doctor we got was… not my favorite. She seemed unclear why we were even there, and kept interrupting and talking over me when I tried to explain. She was incredibly dismissive about our concerns, declared Thora’s eczema as “not that bad” without doing an examination on her or even looking at her legs which are always the worst, vehemently disagreed with our decision to meet with a nutritionist (“No, no, no. That’s… Ugh. You don’t need that.”) and dropped her arms down and her head back in annoyance when we mentioned the phrase “gut health” within the context of Thora’s high IgE number. She also seemed to not believe that Thora could have a sensitivity to dairy even though she didn’t test as allergic and sternly told us that strictly avoiding foods was how you make allergies worse. It really felt like she thought we were enormous idiots for eliminating the foods she tested positive to on the IgE test. The allergist also had zero concerns about Thora’s high IgE number and told us we could give her some Zyrtec if she’s itchy but otherwise feed her whatever we want. 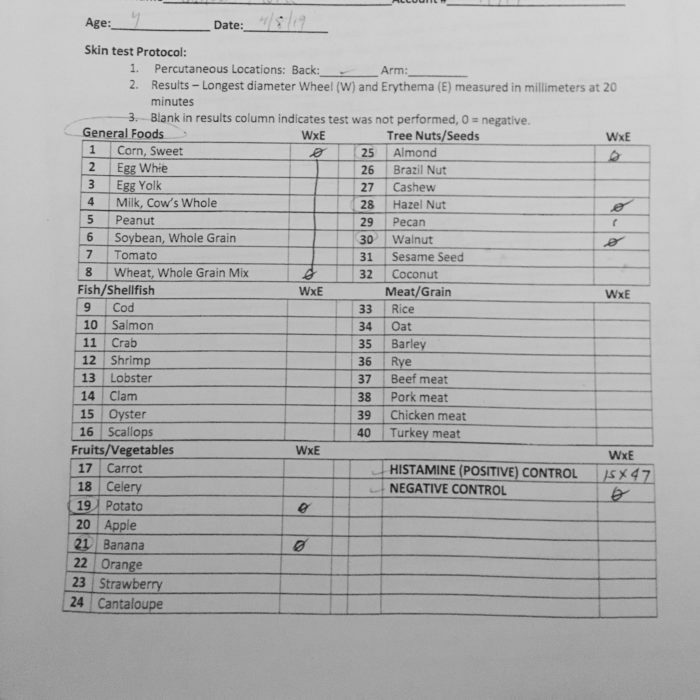 However, she did agree to do the skin prick test to confirm/deny her allergies to many of the foods on the initial list, plus dust mites, cats, and dogs. Thora showed as allergic to LITERALLY ZERO of the items. Not allergic to corn, egg whites, egg yolks, milk, peanuts, soy, tomato, wheat, almond, hazelnuts, walnuts, potatoes, or bananas according to the skin prick test. It’s hard to describe how completely bewildering this was. It seemed to validate the allergy clinic doctor’s (perceived) opinion that we were bananas for even showing up there, and completely invalidated Dr. M’s advice to avoid those foods. The allergist’s parting words were basically “forget the blood test, feed her all the foods.” The only thing she did seem concerned about was Thora’s reaction to the kiwi last fall, and she wanted to bring us back in at the end of summer to do a skin prick test for kiwis in addition to an Oral Food Challenge where they feed the kid the food they’re supposedly allergic to and see what happens. That way, we know for sure that she’s allergic before she starts school and we can make sure she has an EpiPen in case she needs it. We left that appointment even more confused than when we went in. I was obviously incredibly relieved that she didn’t seem to have a skin reaction to any of the foods the blood test said she was “allergic” to, but… why the disparity? Is she allergic or is she not? Meeting with the nutritionist was so helpful. She laid out the science behind the different kinds of allergy tests and the antibodies the tests are looking for. She also described the concept of “leaky gut” and how that can relate to allergies and Thora’s high IgE number. Her take was that the IgE test results are (more or less) a symptom of a larger gut health problem for Thora. If her guts were healthy and not-leaky, those IgE antibodies wouldn’t be able to enter her bloodstream to create that high number. Because her guts and intestinal flora have been damaged somehow (possibly through antibiotic use? ), they’re spilling this stuff into her bloodstream which is causing the eczema and the alarming IgE test. This also helps explain why her skin prick test showed negative to all these items – she has antibodies for them in her bloodstream, but they haven’t risen to the level that they cause an obvious histamine reaction on her skin. We made a plan that includes gut-friendly foods like bone broth, good meats, and organic fruits and vegetables, and does not include GMOs, corn, dairy, or wheat. It feels hard but do-able, unlike her initial elimination diet! We are also adding in probiotics, vitamins A, D, E, and K, and I think some digestive enzymes though we haven’t received those yet. She said we should see results within about a month – kids’ tissues heal quickly so she’d be surprised if it took longer than that. I felt so much better after meeting with the nutritionist! I am still somewhat irritated that Thora’s doctor treated the IgE test like it was gospel without explaining more of the science behind it. For instance, there was no indication to me that those test results could change in the future OR that simply because she has antibodies, it doesn’t mean we have to, like, clear the house of those things. I was already envisioning changing Thora’s shampoo and conditioner and our bathroom cleaner because they’re formulated with coconuts, and not letting her play with Play-Doh because it contains wheat. Those things are still fine for her, but that was definitely not clear to me from that initial meeting. It also helped explain several things, like why she had never had an ear infection until about the last 18 months, and why she got a UTI right before her fourth birthday, and why she always seems to have a cold. Her body’s immune system is so preoccupied with this leaky gut issue and creating antibodies that it probably doesn’t have anything left to fight off basic infections. I am also incredibly irritated at the allergist and her dismissive attitude. Even if she felt we didn’t need to be there, EXPLAIN WHY and don’t make us feel stupid for being worried about an alarming test result and trying our best to help our daughter. We are still in the thick of things and haven’t started the enzymes or the probiotics yet (they have yet to arrive in the mail!) but I’m glad we have a plan going forward! Here’s hoping it helps her eczema and her overall health.